Born in Triana (Sevilla) in 1952 Milagros Mengibar started dancing in the tablao El Patio Andaluz at 13. 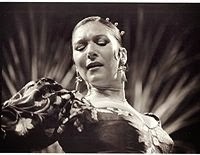 In 1974 she won the National Dance Argentinita in the National Contest of Flamenco Art in Córdoba. In 1988 she triumphed in the Biennial of Seville and became part of the show Stars of the Biennale, which traveled to Japan. For years now she has combined teaching private dance classes and teaching at the Foundation of Cristina Herrera in Sevilla. Una pequeña muestra del espectáculo Abolengo de Farruquito realizado en el Festival de Jerez 2013 junto a Karime Amaya. Farruquito, Juan Manuel Fernandez Montoya was born in Seville in 1982, son of flamenco singer El Moreno and dancer La Farruca. He is also the grandson of one of the greatest dancers in the history of flamenco, El Farruco, which gives him a flamenco background that is second to none. Karime Amaya was born in Mexico and, as can be deduced from her surname, she belongs to the glorious Amaya dynasty. In fact, she is the great-niece of the great Carmen Amaya. She wanted to be a vet, but the pull of her flamenco roots was stronger – when she was very small she could already distinguish all the palos of flamenco – and, when she was 12, she began to train as a bailaora at the academy her family had set up in Mexico City. Winy’s daughter made the leap to Spain at the hands of the bailaor Antonio Canales. Since then, Karime Amaya has performed at the best-known tablaos in the country and has worked with artists like Manuela Carrasco. Hers is an art learned in the diaspora but faithful to tradition, like that of the legendary bailaora from Somorrostro Carmen Amaya.